Who's Bad carries on the legacy of Michael Jackson's music for the next generation. 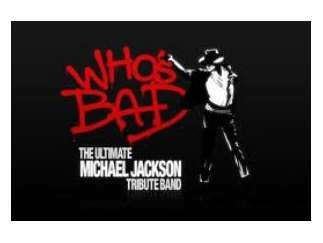 The band recreates the music, choreography and legendary showmanship of Michael Jackson, from his days in the Jackson 5 through "Off the Wall" and "Thriller" to "Invincible." Joseph Bell has worked with Travis Payne, lead choreographer from the "This Is It" tour to perfect Michael Jackson's moves like the Moonwalk, which was introduced in the video for "Billie Jean."